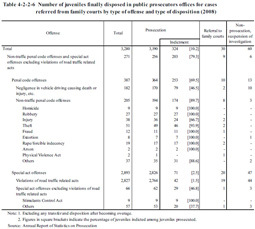 Table 4-2-2-6 shows the number of juveniles disposed in public prosecutors offices for cases referred from family courts by type of offense and type of disposition. 97.3% of cases referred from family courts were prosecuted and 10.2% of the prosecuted juveniles indicted. The reason that the percentage is so low is because the percentage of those who were indicted for violations of road traffic related acts was itself low, at 1.5% of those prosecuted, though the cases for violations of road traffic related acts accounted for about 90% of the total. For non-traffic penal code offenses and special act offenses excluding violations of road traffic related acts, 79.3% (89.7% of non-traffic penal code offenses and 46.8% of special act offenses excluding violations of road traffic related acts) were indicted. Table 4-2-2-7 shows the sentencing of juveniles in the court of first instance (district/summary court) by type of offense and judgment in 2008.